Blue trevally larvae (Carangoides ferdau) were raised from wild-spawned eggs at 77-79F on wild copepods. First record of Blue trevally culture. 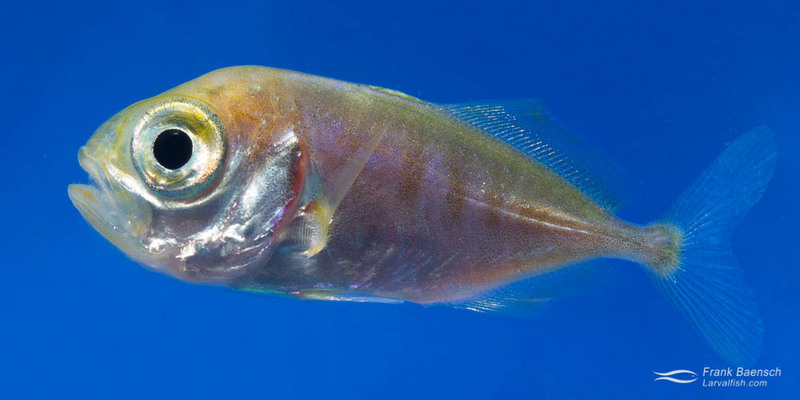 Jacks, pompanos, and trevallies (family Carangidae) are typically strong swimming, carnivorous, silvery, pelagic fishes with a deeply forked tail. The family comprises about 32 genera and 140 species, many of which are valuable food and game fish. School of Blue Trevally (Carangoides ferdau) on a reef in PNG. The Blue Trevally (Carangoides ferdau) is a common, moderately large (up to 27″/70 cm) jack species that is widespread throughout the Indo-Pacific from South Africa to Hawaii. It is an excellent food fish, unlike most other members in this genus. In Hawaii, adults have been seen following foraging bonefish or goatfish, consuming leftovers uncovered by the foragers. Juveniles sometimes seek shelter among the tentacles of large pelagic jellyfish. Within the Carangid family, the Almaco Jack (Seriola rivoliana), the Greater Amberjack (Seriola dumerili), the Yellowtail Amberjack (Seriola lalandi), the Japanese Yellowtail Jack (Seriola quinqueradiata), and the Florida Pompano (Trachinotus carolinus) are aquacultured for food. Little information about the reproduction and growth of Carangoides species is available. Blue Trevally (Carangoides ferdau) larvae reared in the laboratory. C. ferdau juveniles were cultured in the spring of 2013 from eggs collected in coastal waters off Oahu, Hawaii. This species has only appeared in egg tows during the spring and summer, suggesting that spawning occurs with increasing daylight and water temperatures. C. ferdau eggs are clear, spherical and measure close to 0.75 mm in diameter, with a single oil globule. Several brown spots cover the embryo. The larvae grow fast. They measure 2.1 mm TL at hatching, start to feed on 3 dph (3.1 mm TL), complete flexion near 12 dph (6.4 mm TL) and start to settle (associate with the tank sides) near 20 dph (12.4 mm TL). The larvae spend most of the time feeding on copepods at the surface and were prone to hyper-inflating their swim bladder. Frequent removal of surface scum and reducing light levels solved this problem. Settlement starts shortly after caudal fin formation is complete. The fish were transferred to grow-out at this time. Caranx and Carangoides species develop dark bars on the body during juvenile transformation. Barring on the C. ferdau juveniles was not observed until 40 dph (17 mm). More frequent feedings during grow-out would likely shorten the late larval period significantly. The juveniles were released on a shallow reef together with cultured C. ovalis. While most of the C. ovalis juveniles were eaten by surrounding reef fish (Parupeneus insularis, Iniistius baldwini), all of the C. ferdau juveniles escaped the predators, racing off into the blue. This is the first documented larval rearing of the Blue Trevally (C. ferdau).